Over 1,000 backpacks filled the Grove at the University of Mississippi on March 19, as part of an initiative by students to bring awareness to suicide and mental health. Each backpack symbolized a college student who had lost his or her life to suicide and included a personal story from someone who had lost a loved one to suicide. The Grove at the University of Mississippi was blanketed with more than 1,000 backpacks on March 19, each representing a college student who lost their life to suicide. Sponsored by the Active Minds chapter at the University of Mississippi, the Send Silence Packing event is a traveling exhibit that raises awareness for mental health by sharing the stories of young adults who have lost their lives to suicide. Right Track Medical Group was among the sponsors who worked with Active Minds to make the event possible. “It’s a privilege for us to be able to support an effort like this,” said Right Track Medical Group’s Director of Outreach Carol Ann Hughes, who spent the day in the Grove alongside Therapist Emily Grace Ames, LPC. According to Active Minds, a national nonprofit organization, some 39 percent of students in college will experience a significant mental health issue. Among students, suicide is the second leading cause of death. In a 2015 study of 800 people between ages 18 and 32, more than 70 percent of those responding agreed that people their age were more open to address mental-health topics than older people. At Ole Miss, the goal of the Active Minds chapter is to spark conversation and eliminate the stigma surrounding mental health. Founded three years ago, the student-run organization hosts events such as Send Silence Packing throughout the year as a way to encourage action and connect students with mental health resources. 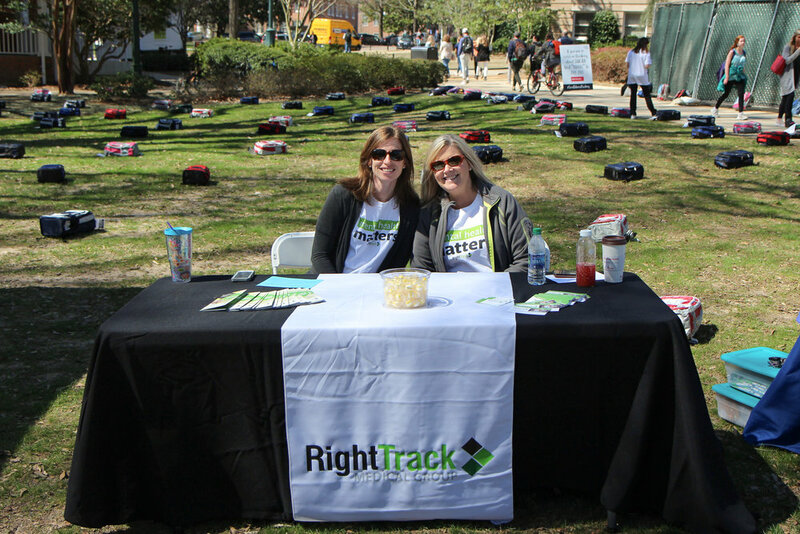 Right Track Medical Group’s Therapist Emily Grace Ames, LPC, and Director of Outreach Carol Ann Hughes spent the day in the Grove offering support to students. “Changing the conversation about mental health is important because merely showing someone that they are heard can impact his or her life forever,” said Jessica Tran, current president of Active Minds. The Send Silence Packing tour will visit more than 30 college campuses this year, said tour coordinator Courtney Burke. For Burke, the most important part of these events is seeing it breaking the stigma around suicide and mental health. Students will be able to participate in more upcoming events hosted by Active Minds during Mental Health Week, April 1-5. Events include a Humans of Ole Miss exhibit, featuring students’ photos and stories. In another event, students will be given a flower and encouraged to pass it along to someone else, signifying how many lives can be touched by a single person. Free events will take place throughout the week, such as a yoga class in the Grove. For more information on Mental Health Week at the University of Mississippi, visit Active Minds on Facebookor Instagram.